What’s Blooming Early February in San Diego? Having the opportunity to be out on the road so much and thinking of all those poor souls who suffer winter weather with snow and cold, it amazes me how many winter blooming plants in San Diego are on display this time of year. Still hanging on are the Evergreen Pears with their gorgeous white blossoms like a cloud surrounding the dark bark of the tree. Various colors of the rainbow represent Hibiscus (a much too tropical plant, but many do exist and they are hard to miss). Lantana is evident everywhere, the purple of this plant is always eye catching. Leptospermums or Tea Trees are showing some color, pink, red or white. Lilac vine is also spectacular with its purple trailing flowers. Pink Jasmine is another vine of note and fragrance that can be overpowering. Various succulents, Aloes in particular are in bloom now. 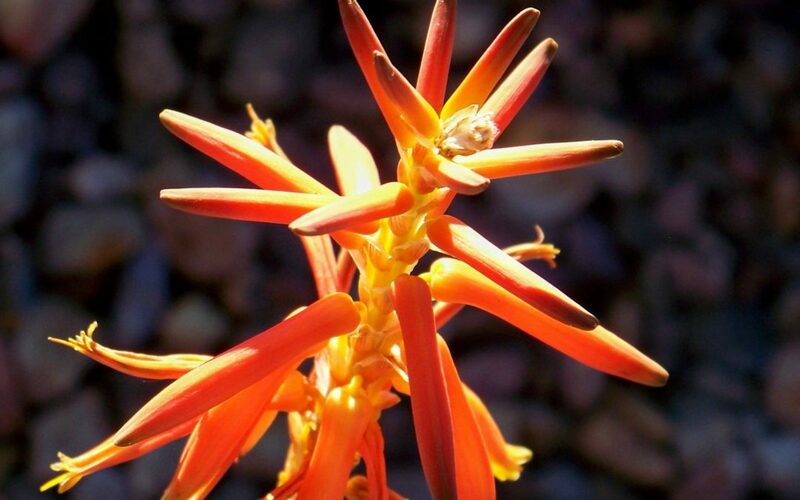 The brilliant coral colored flowers of the aptly named Coral Aloe is one of the more noticeable winter blooming plants in San Diego. And Coral Trees with their more reddish hue are quite brilliant too on a dreary day. You can’t go a block before seeing some neon color of Bougainvillea in a front yard in older areas of San Diego. Bird of Paradise still captures the attention of passersby as they are at their peak bloom in the chill of our winter. Chinese Fringe Flower and Grevilleas are also in full glory at this time. Sure, we have to give up the blinding light of a fresh snowfall and the silhouettes of every tree but a conifer, but I don’t think any one person can object to the manmade and natural beauty of San Diego. Having color year round is always welcome in my yard, and I can offer the same to you with careful design considerations. Winter blooming plants in San Diego are everywhere! Consult with Letz Design to have your choice of color all winter long.